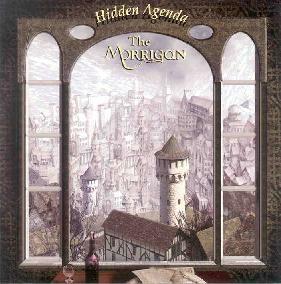 The Morrigan - "Hidden Agenda"
The Morrigan are a British band that play a Celtic charged brand of progressive rock. The band consists of Cathy Alexander on vocals, recorders, keyboards and 12 string guitar, Mervyn B. on vocals, flute, bass and percussion, Colin Masson on guitar, bass, keyboards and vocals, Dave Lodder on guitar, bass and keyboards, Arch on drums, percussion and vocals, and guest Matt Carter on mandolin and banjo. Hidden Agenda is their fifth album. The Morrigan are influenced by equal parts symphonic progressive rock and traditional Celtic music, sometimes leaning heavily in either direction, and sometimes injecting the progressive elements with healthy doses of Celtic fun. Wolfstone and Tempest are bands that come to mind, and certainly that killer band from the past - Horslips. But The Morrigan have a much stronger classic progressive rock edge that is reminiscent of Rush's lighter moments and perhaps a bit of Genesis. Songs like "Swallow's Tail", "In The End" and "Slieve Russell/March Hare" showcase the bands mixture of accessible prog rock with heavy keyboards and crunchy guitars, as well as flutes and recorders which give the music a traditional Celtic kick. My hands down favorite track of the set is "A Night To Remember", which at nearly 10 minutes shows the band stretching out and jamming like nowhere else on the album. Fans of classic progressive rock will be drooling over this one as all the favored cliches are here... intricate thematic development, theatrical instrumental and vocal delivery, and tight ensemble performance. Prog rock theater at it's very best. On the more purely traditional Celtic side are "Volta/Basse Danse/Volia", "South Australia" and "Joe Cooley's Reel". - "Volta/Basse Danse/Volia" is an instrumental that begins with flute, recorder and mandolin taking center stage for a bit of Renaissance flair, until launching into a full blown rocking Celtic dance fest. "South Australia" has even more of a traditional Celtic sound. And "Joe Cooley's Reel" is a fiery Celtic rocker with marvelous playing from all. Overall, this is accessible stuff but the musicianship is top notch and the songs and arrangements will please fans of Celtic flavored progressive rock. English Garden is part of the Hi-Note Music group. You can visit their web site at: http://www.hinotemusic.com. You can visit The Morrigan web site at: http://freespace.virgin.net/themorrigan.1.